Giles Scott (GBR) continues to dominate the Finn Gold Cup in Takapuna, New Zealand. In spite of only winning one race so far this week he has amassed an impressive 52 point lead after eight races with just three to sail to decide the 2015 Finn world championship. 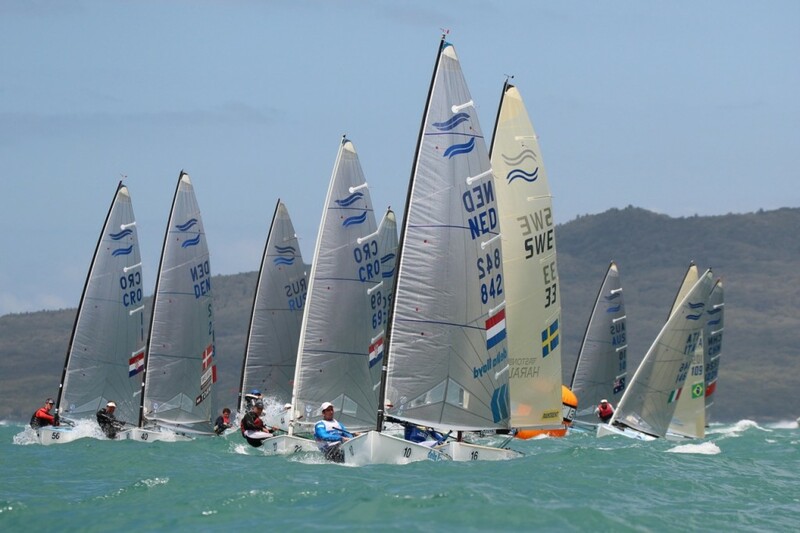 Three races were sailed Friday with three different winners: Max Salminen (SWE), who moves up to third behind Scott and Vasilij Zbogar (SLO), Pieter-Jan Postma (NED) and Ioannis Mitakis (GRE). 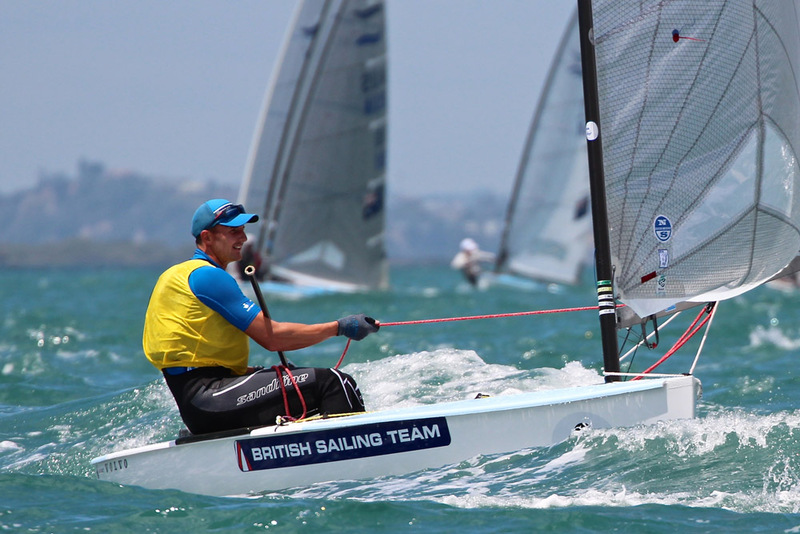 The British team still dominates the standings with 3 in the first 10 – the only nation with more than one sailor in medal race contention, showing the great depth of the GBR squad. It was a tough day in Takapuna, but after a few days of light winds the sailors were able to stretch their legs and sail the boats as hard as they liked. 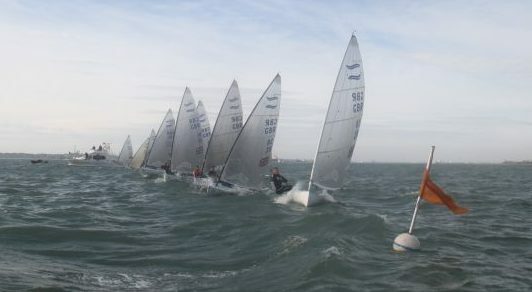 The generally clear blue skies and strengthening wind played to the assets of the Finn and the Finn sailors and though the 75 sailors came ashore exhausted, they also have ashore satisfied after a great day’s racing. 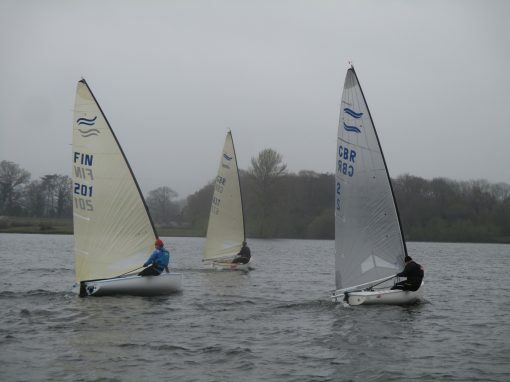 With the black flag up, race 6 got away after several attempts, with two boats pulled out. 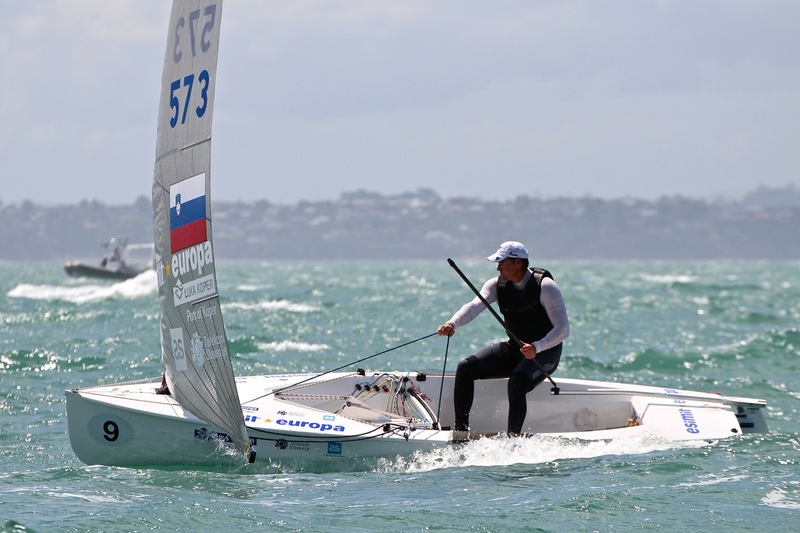 Ioannis Mitakis (GRE) led at the top mark from Arkadiy Kistanov (RUS) and Jonathan Lobert (FRA) but Salminen had taken the lead and by the gate extended away to win from Josh Junior (NZL) and Anders Pedersen (NOR). Scott had moved up to second at the gate but lost out on the second beat to drop to fourth. There were numerous changes on the second beat with boats moving from the 40s to the top five and vice versa. The Oscar flag for free pumping went up at the first top mark and stayed up all day as the wind built through the day to reach 14-16 knots by the end of racing. Race 7 was started very quickly in a slightly increased wind, but still onshore with a very tricky chop to steer through. Pieter-Jan Postma finally put together a good first beat to dominate and lead round the top mark from the right. He extended downwind to build a big lead at the gate. Alejandro Foglia (URU) rounded fourth and moved up to second by the gate, a position he maintained all the way to the finish. Jonas Høgh-Christensen (DEN) crossed in third after rounding the top mark in fifth. 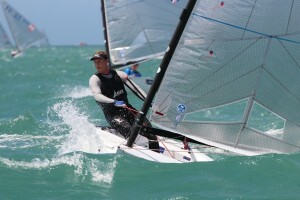 Scott had rounded the top mark in the 40s, but managed to recover to 15th by the finish. More cloud arrived for the third race of the day with the wind now at 12-15 knots. It was perfect conditions for Finn sailing with nice waves and great sailing, and this suited Mitakis perfectly as he led round the top mark again. This time he kept hold of the lead to win the race while Scott moved through the fleet to cross in second, while Lobert ended a good day with a third. One of the four black flag casualties of the race was Ivan Kljakovic Gaspic (CRO), who adds a second letter score to his card and effectively ends his medal race hopes. As well as the top 10 landscape changing dramatically, so has the list of four nations occupying the important space to qualify for Rio. Currently Greece, Estonia, Netherlands and Uruguay are the four nations, but Russia, Italy and Czech Republic are all within striking distance, as the finish line looms ever larger. If yesterday was moving day, today was all-change day. All-change except the top of the leaderboard of course, as Scott looks to be inexorably headed towards his third world title. But as we get towards the narrow end of the championship, the points behind him have closed up. 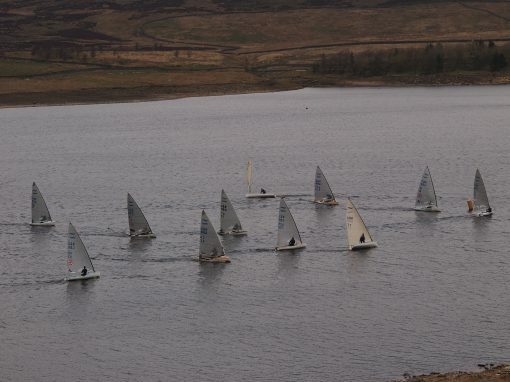 With just 25 points separating the next 11 boats, there is still along way to go in this very high scoring championship. 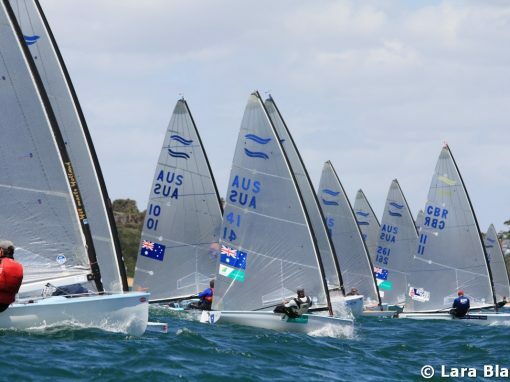 The fleet series concludes on Saturday with two more races scheduled from 12.00 By the end of the day some of the four nations from this event to qualify for a place in Rio may have already been decided, ahead of Sunday’s final race and medal race.